For those who are not familiar with this instrument, it is best described simply as a self-playing piano. The notes to be played are represented by tiny perforations on interchangeable rolls of paper, while the player mechanism is powered entirely by suction, generated by the operation of two foot pedals. The operator, or 'pianolist', achieves dynamic shading of the music by varying the degree of pressure applied to the foot pedals. In addition, a set of hand-operated levers mounted just below the front of the keyboard provide accentuation, tempo control, activation of the sustain and soft pedals and selection of play and rewind modes. In the hands of an accomplished operator, a convincingly lifelike musical performance is achievable. The player piano enjoyed its peak of popularity between 1900 and 1930, after which time the wireless, which was significantly cheaper and more versatile, became the main source of home entertainment. As the vast majority of player pianos are now at least seventy years old and many are sadly dilapidated, enthusiasts all over the world are devoting much time and effort to the restoration of these remarkable instruments. The paper music rolls are still available in abundance, both old and new and almost all musical tastes are catered for. During the first three decades of the twentieth century, a substantial number of famous pianists committed their performances to music roll, by means of special recording pianos. The rolls recorded by George Gershwin for example are still popular today and although original examples are now scarce, specialists meet the demand from collectors by producing excellent new copies. A player piano can of course be played by hand in the normal way, as the piano action and keyboard are entirely conventional. In fact, it is usually possible to play the keyboard while the roll mechanism is in operation, should any additional notes or harmonies be desired! 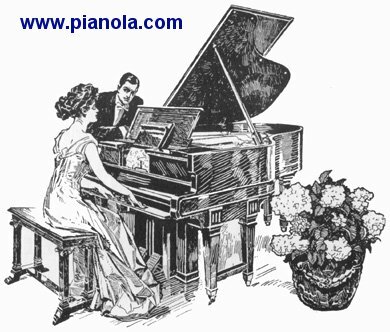 The term 'Pianola' was originally a trademark, first used by the Aeolian Company just over a hundred years ago, but in more recent times has become a generic reference to the self-playing piano. With various diagrams and descriptive text. From the 1890s through to the modern day. A more sophisticated version of the player piano. Duo-Art, Ampico and Welte. Famous pianists who recorded music rolls for the player piano. See how player pianos were marketed when new. Market place for instruments and rolls. Where to buy new and secondhand piano rolls worldwide. Essential reading material, both historical and technical. Buy online. Good selection of CDs. Hear samples & buy online. Locate a technician or buy an instrument. Find out about joining an enthusiast group. Locate the right materials for your restoration. See and hear player pianos in a museum environment. Visit other web sites with a player piano-related theme. This is the home page of Ian, a UK player piano enthusiast. Copyright © The Player Piano Page 1998. Last revised January 25, 2006.